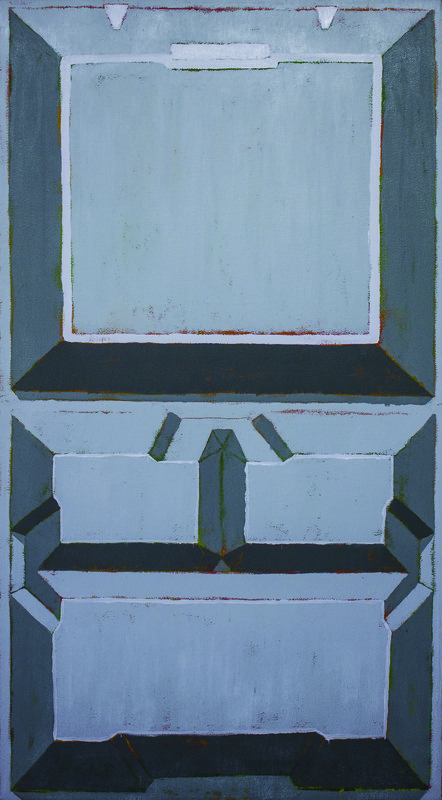 Anthony Palocci Jr., A/C, oil on canvas, 24″ x 18″, 2012. Anthony Palocci Jr. lives and works in Boston, MA. He received his BFA in painting from Montserrat College of Art in Beverly, MA and his MFA from Pratt Institute in Brooklyn, NY. 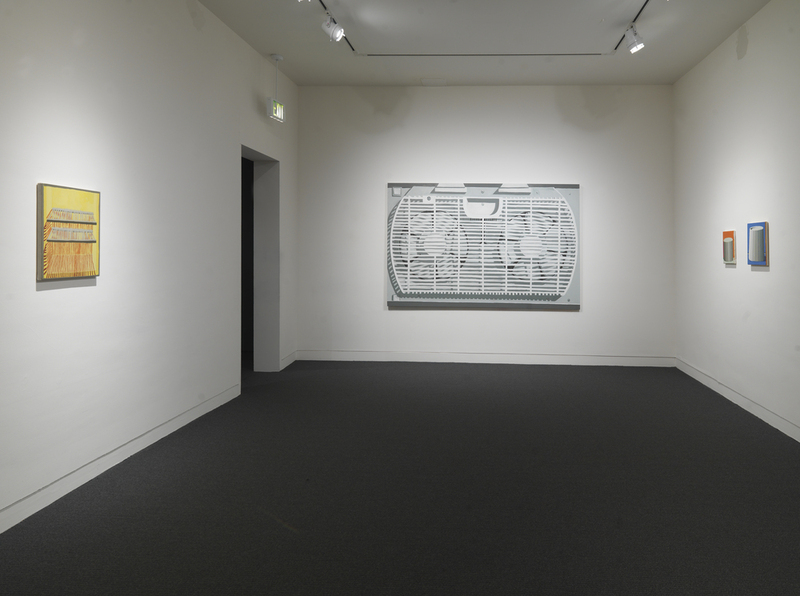 His work has been exhibited throughout the Northeast at locations including et al Projects (Brooklyn, NY), Lot F Gallery (Boston, MA), LAP Projects (Waltham, MA), and is currently on view in the 2013 deCordova Biennial (Lincoln, MA) from Oct. 9, 2013 – April 14, 2014. Palocci is also a contributing writer for New American Paintings and artcritical. Anthony’s studio is just down the hall from mine, so I’m lucky to get to run into him periodically near the communal sink. He’s always generous in sharing what he’s working on, and since he’s a workhorse in the studio, there’s always something new to see. I’ve had the opportunity to stop by many times over the past year and see underpaintings transform into fully-developed, knock-your-socks-off paintings. In our interview, we talked about his process of painting, his interest in everyday objects, and the place of painting in contemporary art. Andrea Evans: Hello Anthony! Thanks so much for having us by your studio. To begin, how did you find your way into art-making? Is it something you have always done, or come upon a little later? You went to Montserrat College of Art in Beverly, MA for undergrad, and then the Pratt Institute in NY for grad school. How has all this time in art school shaped your work and ideas? Anthony Palocci Jr.: I suppose I’ve been making art for a long time…sort of unconsciously…just doing things and making things before I was aware they could be art. I’ve always been interested in making things, from models to songs and paintings, but never really took anything seriously or thought I could keep doing those things as a profession until I was older and went to art school. School helped me focus, develop ideas and technical skills. It was a time where I wasn’t thinking about anything but painting and art. I always say, I learned to draw at Montserrat and I learned to paint at Pratt. Really, I think I was just lucky to meet the teachers I studied with along the way. I could have struck out if I wasn’t paying attention to certain people. Feels like I am just getting things sorted out this year. 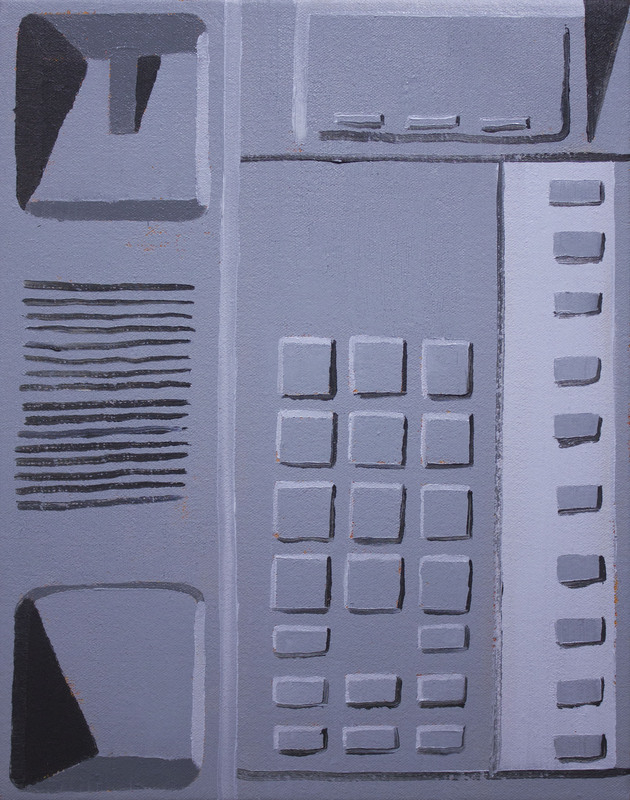 Anthony Palocci Jr., Phone Call, oil on canvas, 11″ x 14″, 2013. AE: After you finished grad school, you moved from Brooklyn back to Massachusetts, and now live and work in the Boston area. Here in Boston, it sometimes seems like there are so many artists moving away, so it’s really nice for those of us who live here to see artists moving back to the area. Why did you decide to return to Massachusetts, and have you been happy to be back? Have you found that your work has shifted at all with the change in environment? AP: I moved to Boston for a number of reasons. 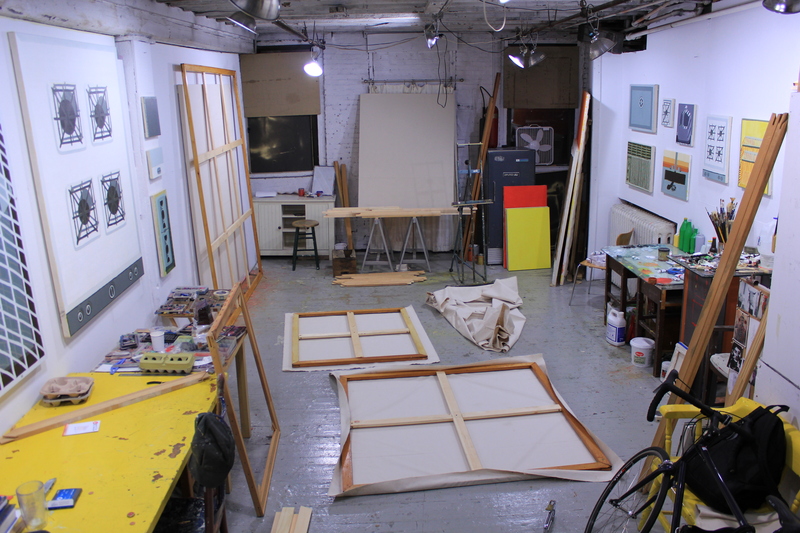 My family is still living around the Boston area, I was offered some teaching positions and I found a studio space. I am happy about the move, I like living in Boston, I like the space it gives me. Absolutely the work has shifted. I make work about my life and my immediate environment, and when that changes, the work changes. While I was in grad school I didn’t really have a life outside of my studies. The only life I had was eating and sleeping, so I made work about that. The truth is, I can paint anywhere. Right now it’s Boston. I have never lived in Boston before so it’s all a new experience for me. I like living in New England, and it will always be where I feel at home. I still go to NYC frequently to see shows and keep up with friends. AE: One of the things that really attracts me to your work is your ability to infuse a kind of magic or energy into everyday objects and spaces. Perhaps this is because I am often teaching beginning drawing classes, and I see so many drawings of whatever students have around them in their dorms. Your work shows us that anything can be made fascinating, that you can paint something as simple as a styrofoam take-out container or a box fan, and make it absolutely compelling. Your paintings slow us down and shift our vision; I think they allow us to see our everyday world with fresh eyes, with a kind of childlike wonder and curiosity. Are the objects themselves important to you as subject matter? Or do they simply provide the opportunity to observe and translate the play of light and color on a form in space? How do choose what to paint? 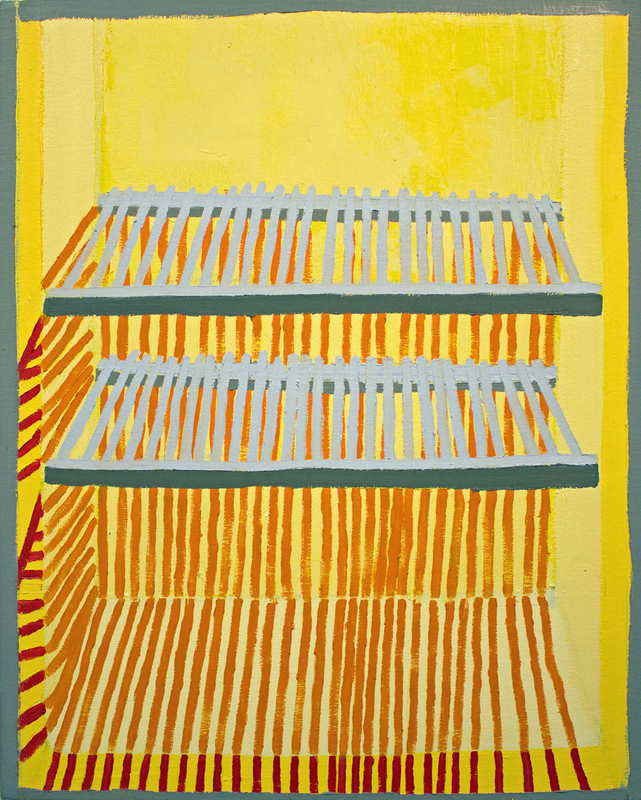 Anthony Palocci Jr., Empty Fridge, oil on canvas, 16″ x 20″, 2012. AP: The objects and their form are important to me. It’s not their design that gets me all the time, I’m kind of turned off by design, like frivolous attachments or color, conscious decisions to make things more appealing. I am thinking about what the objects mean to us and how I can destroy that and expose them, and expose us at the same time. It is about the way we limit our understanding of the world by the objects we surround ourselves with. I think about the strangeness in things; like how alien something ordinary can feel if I stop to look at how many sides it has or what happens if I start thinking about it outside of its functional use, as just a form. I play with those ideas in the scale of some of the paintings. Sometimes it takes a serious jump in scale to talk about them the way that I want to, to make them unfamiliar. I have to look at a lot of different things before I pick something out. Things have to have a certain quality to work for me. Other times things find me and it is real obvious. I take notes of ideas I get while out and bring them back to the studio and sift through what I can make out of my handwriting and tiny drawings. 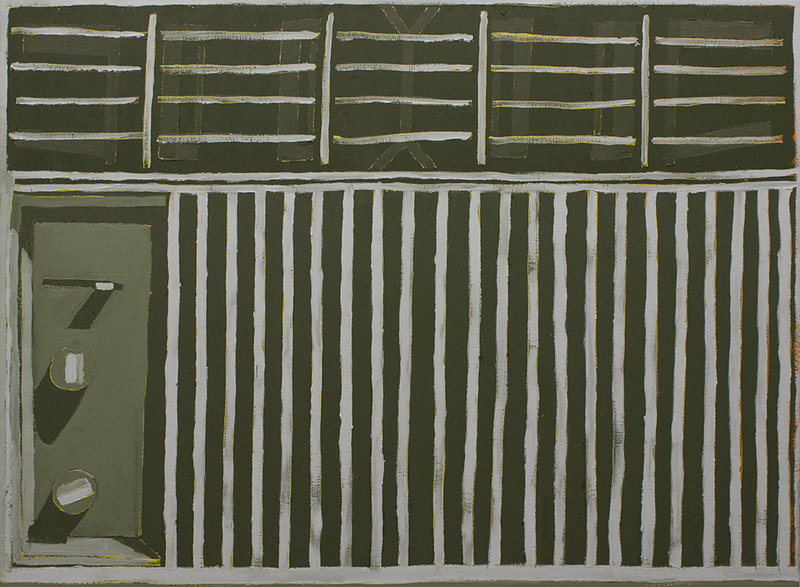 Anthony Palocci Jr., Take-out, oil on canvas, 22″ x 40″, 2013. AE: I’ve been lucky enough to visit your studio a few times in the past few months, and I’ve really been impressed with your productivity. Each time I’ve come for a visit, you have made some serious progress, moving from studies, maquettes, and underpaintings to (often) large, finished paintings. Is this the result of working quickly, or putting long hours in the studio? Are you someone who keeps regular studio hours? What’s a day in the studio like for you? AP: I like to do full days in the studio, 9-5 or 8-4, depends on any other obligations, and often I like to stay later. Any time I have where there’s nothing for me to do, I go there or I’m writing, studying or drawing somewhere else. I am always planning and setting myself up for what is going to happen next. I have at least six things going on at once in different stages of completion. So that way if something goes wrong, or I have a question or whatever, I can move on and do something else and come back to it later. It is a good way for me to keep busy if I am having a problem. There will be a day where I am building stretchers and stretching and priming canvases and that’s it. That’s usually a two to three day job, with about four large-scale surfaces and countless small ones. I make sure to have at least three small canvases ready to go in case I need to address something in another painting that I don’t understand yet, whether it’s how to paint the light, a color decision or some drawing issue. If I have some deadline to meet I’ll be in the studio more than usual, even if I am not working I just like to sit around in there and think about what’s happening. AE: The other great thing about being able to see your work in progress is to see how you start a painting. You often begin by laying down a very saturated color, such as yellow or orange, over the entire canvas. Much of this color is covered up by the time you get to a finished painting, but it still peeks out in places and is visible on the sides of the painting. So even when you have a piece that may be almost entirely grey scale, there is still this warm undertone that vibrates between the cracks. I’m sure you have heard this a lot, but it reminds me a bit of Wayne Thiebaud. However, I think you use color and paint in a pretty different way than he does. While his paint is often almost like icing on a cake, yours is a little rougher and stiffer. In many pieces, the forms are somewhat simplified and blocky, and there’s an imperfection in your edges, like you don’t want them to be too perfect. How did you develop this way of painting? AP: I learned if I started out with a colored underpainting, it would enrich the luminosity of the color and painting I end up with. If I leave it white it feels dead, when there is color underneath it brings life to the work, there is a depth created there. 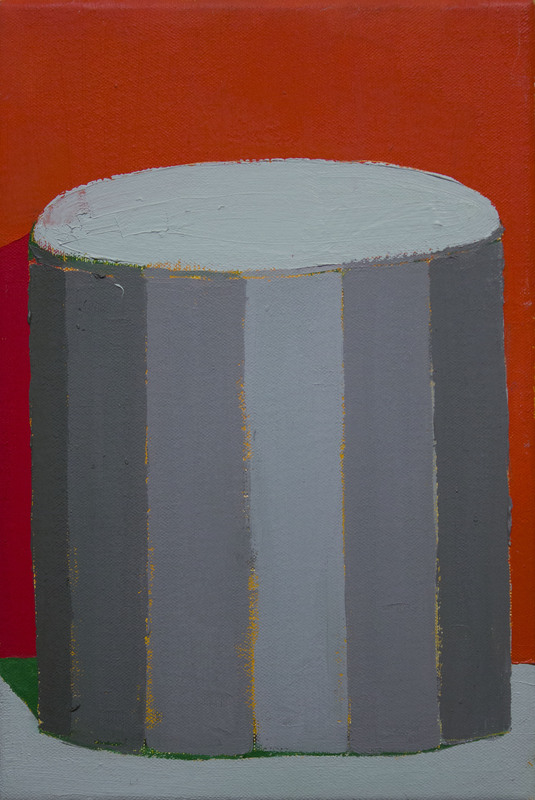 Anthony Palocci Jr., Knob, oil on canvas, 9″ x 12″, 2013. I am playing around more with different colors; the underpaintings depend on what I am going to put over them. 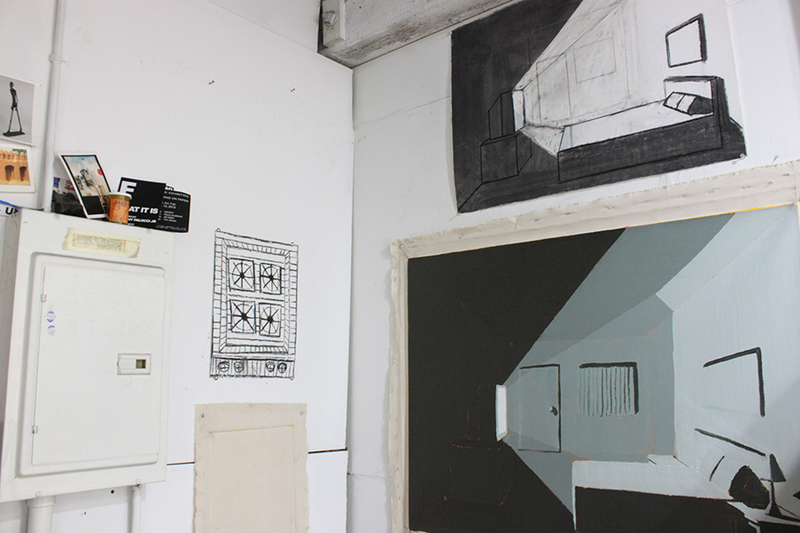 It is also a way for me to decipher the space in the work. I am often working with an extreme shallow space and it is easy to get confused, so different colors mean different levels, or layers of the space. For example, in some paintings I will have green all the way back, red in the middle and yellow up front. In others it will all be meshed together. Those decisions vary with what will go on top. In Velazquez’s Apollo in the Forge of Vulcan, there is a fireplace behind the second figure from the right side of the composition and you can see how he painted orange under everything around it before he painting the figures and the room. You can see it under their skin, the room’s walls, and then it comes out in metal they are forming and to Apollo’s robe. That establishes a unity within the painting and makes everyone feel alive, it also connects everything conceptually to the heat of the stove, as they are the blacksmiths. Looking at paintings is how I developed this way of painting. It is how paintings used to be made. It was the Impressionist painters who started painting on just a white ground, they were looking for the impression of what they were looking at, just the light. Everyone else was looking for the real thing, and that’s what I want. 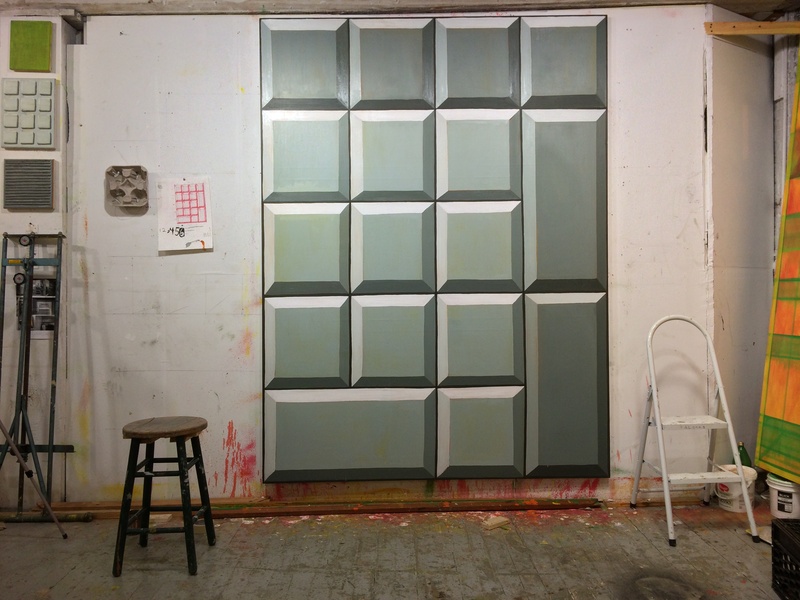 AE: I was excited to see a couple of your new huge paintings in your studio during our visit: the grey-scale motel room painting and the grocery store shelves stacked with gallons of water. I know these pieces were largely influenced by a recent job you had that involved driving around different parts of the Northeast. In many of your other pieces, it seems that you work a primarily from objects and spaces you interact with on a daily basis; in these new paintings, you are working from things and spaces that you came into contact while on the road, things that are perhaps a little more foreign to you. In the paintings of your sink or shower, there is the process of looking carefully and intently at something common, something you know well. When we travel, we often see things for the first time, and they appear new, unique, and particular. Do these newer paintings feel different to you, as you are in the process of planning and creating them? Is their content different than the other work? Or is the process of seeing and translating into paint the same across all subject matter? AP: I’m trying to see the things I am painting like new things all the time. I was thinking of this idea of the motel room as a metaphor for that impulse. The motels I was staying at while I was driving trucks were always on the sides of highways surrounded by chain restaurants and supermarkets, the experience was always the same and was very alienating. The motel room became this symbol of that idea of looking at objects as if they were all foreign or unfamiliar. I also look at the room as a thing too, something someone built, big enough for someone else to stay in; it’s just a hole. It is a little different than the knob on my kitchen sink that I turn everyday, but if that weren’t my knob it would be someone else’s, same thing with the room, and if no one stayed in the room or turned the knob, there would still be the room and the knob. There is no one in my paintings besides the person who made the painting and the person(s) looking at them. It is a way to look at a world where there is no one there. 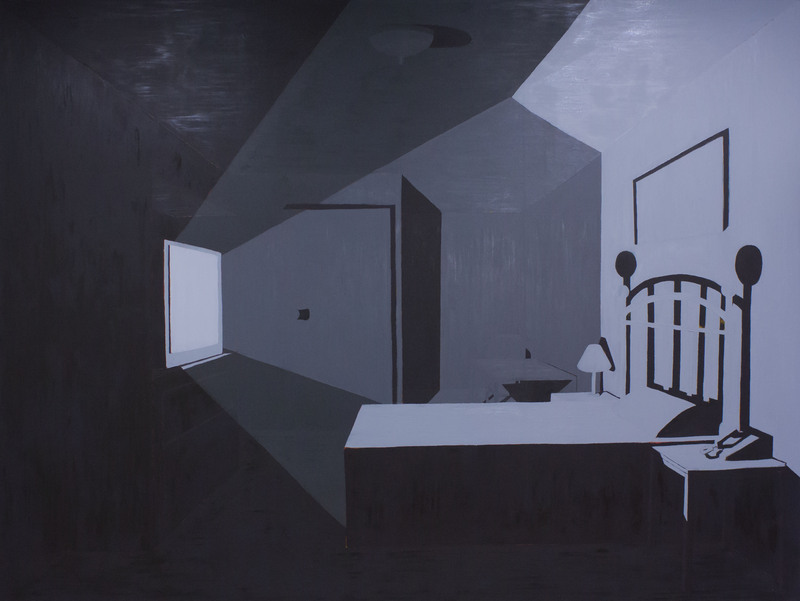 Anthony Palocci Jr., Big Motel Room, oil on canvas, 96″ x 72″, 2013. AE: Congratulations on your inclusion in the 2013 deCordova Biennial, which opened Oct. 9 and runs through April 13, 2014. Your work looks great. I really love your newest piece in the show, “Window Fan”. You mentioned that your process in making this painting was different than in prior pieces. The subject matter definitely feels at home in your repertoire, but the way you are manipulating the paint and building up the image has shifted. Can you talk a little more about this? AP: I have been thinking a lot about how I have been painting. The window fan feels better to me than some of the other large paintings I have made because it feels more painterly. The way it’s applied to the surface, wet on wet and not scraped off all the time and how I built the things within it, like the shadows, the fan parts, the guard, etc. Without thinking about it too much. Every stroke is not conceptualized, rather it is the spirit in which the painting is made. In some other works I would scrape a kind of trough through a layer of paint to put a line in to make it so the colors didn’t mix together, I was concerned with the color remaining uniform and unmixed. I would just paint over in some places, but I got into the trough for a while and it began to feel like an empty gesture. 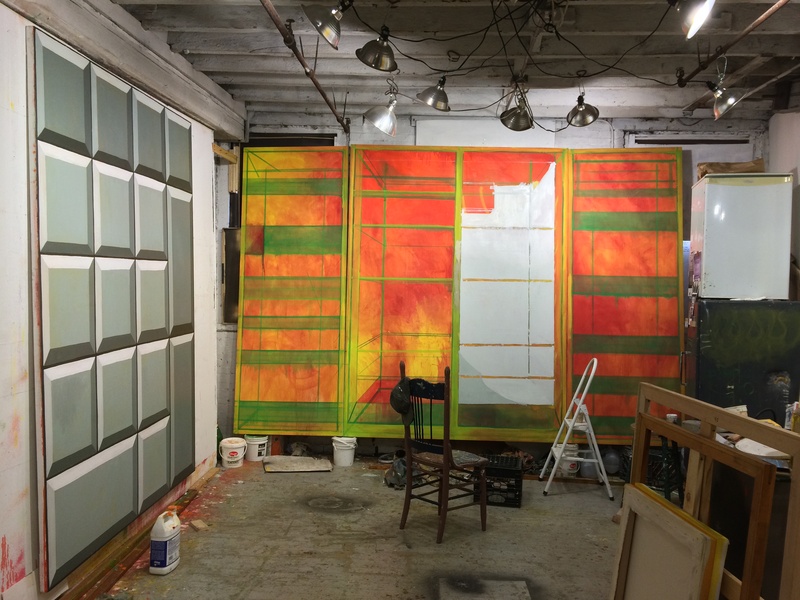 I think with making a painting as big as the window fan, 96” X 60”, there is a real challenge to keep what I’m doing with the paint interesting and at the same time to not be so conscious that that is what I’m trying to do. I am always thinking about what I am doing with the paint in my paintings. And I think about what I do with the paint after I do whatever I do with it. I do something and then go sit in a chair for a while and look at it, decide whether or not it’s good, bad, or a lie. Without that they are merely images. They are all abstractions to me because they are all paintings, and painting is an abstract language. It is a variation of sizes and shapes assembled in a certain order. Of course there is a subject and an object, and that is the very thing I like to play with. How do I make this out of paint? I feel like I am getting better at asking that question to myself. AE: This leads me to a big question about painting in general, or rather, I should say “Painting” (note the capital “P”). When I was in grad school, in a very interdisciplinary program, painters often felt they had to take a stance about why they chose to still make paintings. We all know about the numerous of times that painting has been declared “dead” throughout art history. However, looking around at many contemporary artists, and exhibitions that are up both nationally and internationally, we can see that painting clearly remains very present in the current art world. 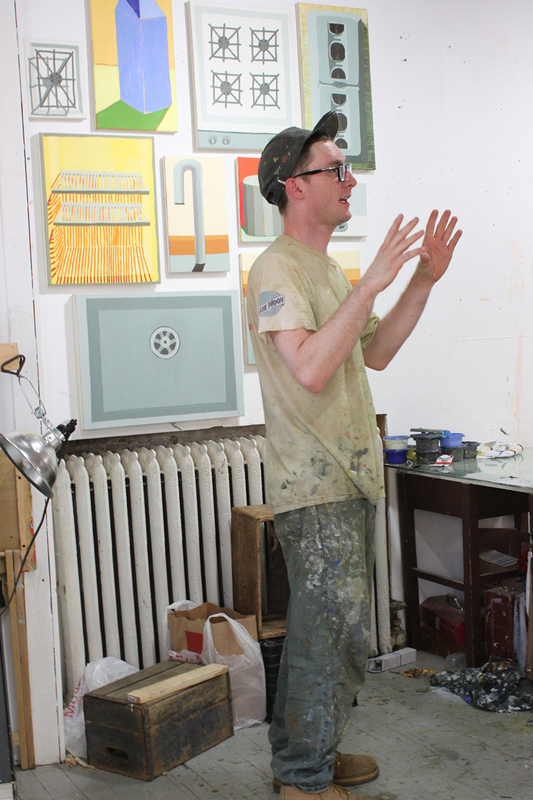 What’s your stance as a contemporary painter on the state of Painting? What can Painting do that no other art medium can? Are there still new things to be said and explored via Painting? AP: Painting is always going to be around…for centuries people have been smearing pigment on different surfaces with hair on the end of a stick. I’m not sure painting is always going to remain as fashionable as it once was or as it is now, and I think there is a great deal of fetishizing that happens to it nowadays. Fetishizing the paint itself I mean, the very act of putting paint on canvas or even better, on linen and the use of paint and the acts involved with painting as a sign of Art. I don’t think that is a very good practice because that won’t stand the test of time and it is self-evident and referential. I don’t think we learn anything from that. I think it needs to say something about humanity, about being human, not just that particular moment in the art world or popular/underground culture. 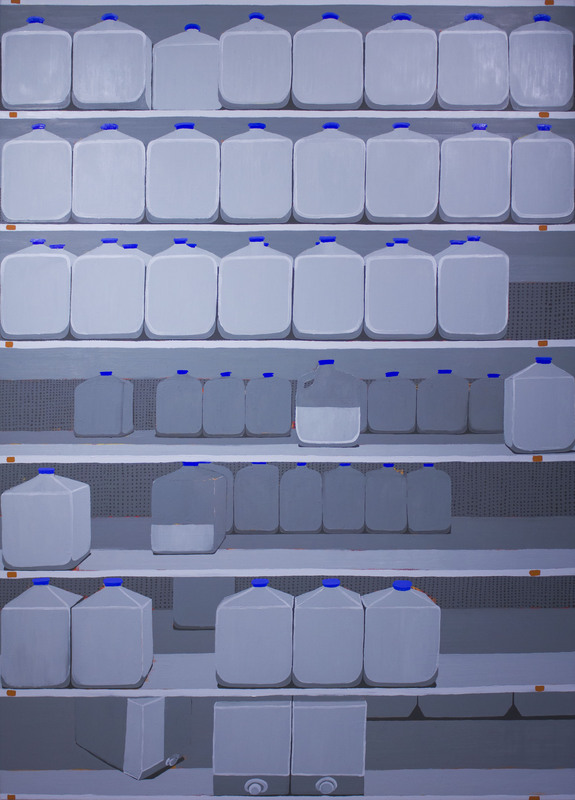 Anthony Palocci Jr., Bottled Water, oil on canvas, 60″ x 84″, 2013. I think it is “ok” to paint now. It’s been a while since Greenberg dictated what painters had to do and since Kaprow liberated everyone. There are a lot of different narratives in art history branching out, some deal with technology and “advancements” using them directly, and some deal with it by talking about reality, in spite of it all. Painting is not an easy thing to do. It’s a lot easier to download Instagram and start taking pictures and bring that into art class and talk about hashtags as the new cultural dictionary, and how relevant that is RIGHT NOW than it is to figure out how to establish a well-considered composition with one or two light sources using only four colors and have that say something and mean something that is relevant RIGHT NOW. It’s also easier to say “it can’t be done.” Painting will always be the most real in my eyes; then again, I am a painter. There is a place for everyone. Some people shouldn’t paint, some people shouldn’t download Instagram. I think as long as there is someone painting and someone else looking, others will paint as well. 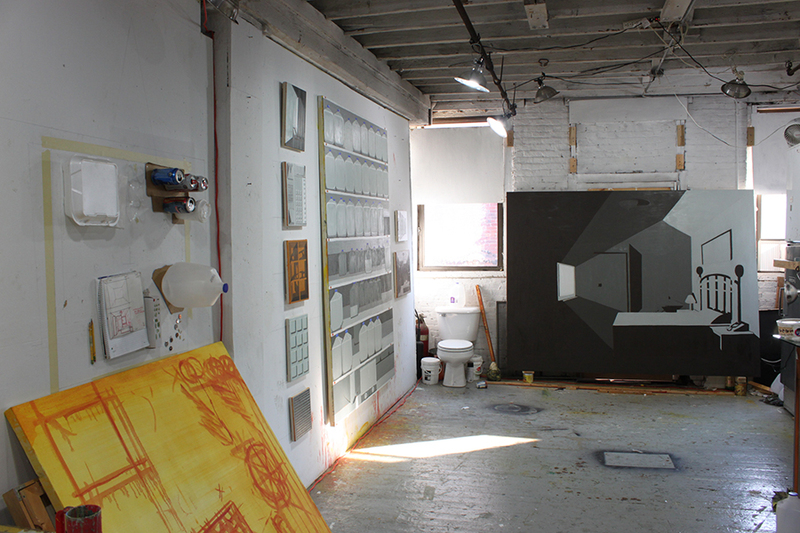 Studio view with one of Anthony’s new paintings, Keypad, oil on canvas, 72″ X 96″, 2013. AE: Well said. So what’s up next for you? Other exhibitions, new work, anything else you want to share with us? AP: I will be having a solo show at et al Projects in Brooklyn, NY this coming Spring. AE: Excellent. We’ll keep an eye out for that. In the meantime, I hope everyone in the area gets a chance to check out your work at the deCordova Biennial. Thanks again for your time, and for sharing your work with us. Tags: Anthony Palocci Jr., decordova, painting. Bookmark the permalink.